Our Lemax Christmas store is now open and new 2018 stock has now arrived - please note all our Lemax Christmas stocks are limited and only those listed will be available. If you already love Lemax and are adding to your existing collection and can't wait to see what's new then subscribe to our mailing list. Dawsons Department Store is proud to be a large stockist of Lemax Christmas Village Pieces and Lemax Figurines holding stock of a large range of Lemax Figurines and Lemax Christmas Figurines, including Lemax Buildings, Lemax Table Accents, Lemax Animated Pieces and Lemax Accessories, which are available to order for shipping to your home anywhere in the UK online now and available to buy in our Department Store in Clitheroe and Skipton during the Christmas period. Have a fantastic Lemax collection on display in your home? Then we would love to hear about it! Send us some photos (less than 20MB in size please) to us at [email protected] with your name and a message about your Lemax Collection and we'll feature it right here on our website - so that others may benefit from your success and share in the delight of your Lemax Collection. We will try to feature all displays and stories here on the website and as a thank you we give you a 10% discount on your next order so that you Lemax Collection can grow and grow. View other submissions here. 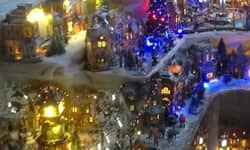 The Christmas Department in our Clitheroe Store showcases a stunning display of Lemax pieces, from the smallest Figurine to largest Buildings, set out as they would be in your home, for inspiration and delight. Each piece of Lemax is hand painted to give each one it's own unique charm and character so whether it is the Reverend Smythe, Rockin' Around The Christmas Tree or Leslie's Pie And Bake Shop, every one will have their own favourite, you can be assured that no one will have one quite the same as yours. One of the many things that make Lemax Villages and Christmas displays loved by so many people. If you want to build a large display village, brighten up at table with a Table Accent or just add a litte Lemax style magic with a figurine or two then our website will have something for you plus all the accessories you need to link your Lemax together into a fantastic display. All Lemax items shown are in stock and we aim to deliver them all within 5 -7 days, often much less. Please take care when opening your Lemax products to check the "hidden compartment" within the packaging. When adpators or other accessories are included with the Lemax products they are often kept in a compartment within the polystyrene packaging. See the image below.